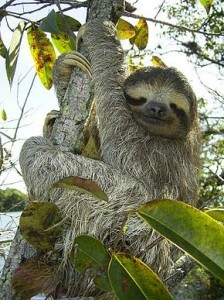 Also this smaller sloth prefers to hang back-side down in the tree-tops. A typical mark is the fair face-mask, that is also colouring part of the front. Their rough fur has a green shimmer from the alga. Three-toed sloth has the ability to turn around its head 180°. Their way of living is very energy-saving. Their metabolism is pretty slow, they adjust their body-temperature to the temperature of the environment, and they are only moving very slowly.